When did bats get so cute? Barbara Gordon appeared on Batman: the Animated Series well before Batgirl did. She had an entire life as Commissioner Gordon's daughter before becoming Batman's newest sidekick. She sat at his bedside (and protected him) after a hitman attempted to kill him, and she rescued several high-ranking city officials from a computer that was making robot duplicates. It wasn't until Two-Face tried to frame her father as a mob lackey that she first put on the costume - and even then, it was mainly to impersonate Batman, not to be her own hero. 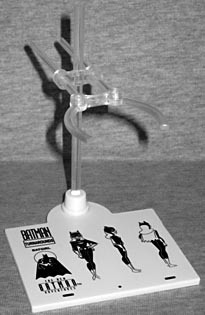 This figure is (according to the paper insert) based on the Season 4 episode "Torch Song," which introduced Garfield Lynns as Firefly. It's not a particularly good or memorable episode, and there's nothing special about it that identifies it as the origin of this figure. This is just a "'New Adventures' redesign" version of Batgirl, but maybe that's enough. Since the Season 4 art was more stylized and darker than what had come before, Barbara has a surprisingly bulbous head, and the majority of her lipstick is black. In the cartoon her eyes were blue, but if there's any paint here, it's so light that it just looks like white with thin black outlines. Consider her "cartoon accurate-ish." 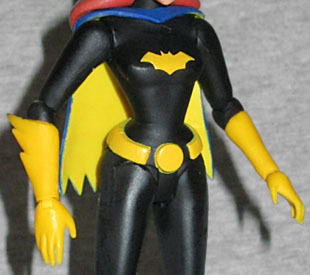 The redesign made Batgirl look more like a typical Bruce Timm woman, with very narrow, exaggerated proportions: a miniscule waist, limbs that dip in at the joints, etc. It's what we've seen so many times on Mattel's JLU figures, except here it's done well. Wat to go, Irene Matar! 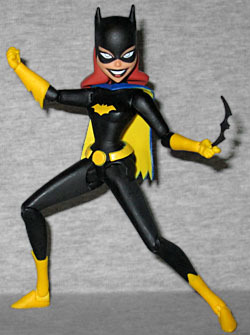 Batgirl's costume is black, with yellow accents. Her boots and gloves are fully sculpted, as is her weird utility belt - a big round buckle that appears to be completely separate from the rest of the belt, which itself is just a plain strip with no detailing in the way of pouches or vials? Wha-huh? The symbol on her chest is only painted, not sculpted, and her cape (blue with a yellow lining) is a loose piece held in place by the head. She's got great articulation, though. We're talking swivel/hinge rocker ankles, swivel boots, hinged knees, H-hips, swivel/hinge shoulders, elbows and wrists, and a balljointed neck. It's a bit disappointing that she doesn't have a waist or any kind of equivalent, but that seems to be par for the course with the female figures. I guess since their belts don't hang straight across their waists, having a swivel there would be too blatant. All her joints move perfectly well, suggesting that the problems DCD had with that in the early series have been fully corrected by now. Although she can stand okay on her own, the set includes one of those nifty little doll stands to help hold her upright in extreme poses (or just when you inevitably bump your shelf). The base itself is just a flat white panel, but it's been printed with the official model sheet turnarounds from the cartoon. A clear plastic rod fits into the base, and supports an arm with a C-clamp on the end. The base takes up about 2⅝" in both directions, and the rod reached 3¾" high. Since the position of the clamp is so variable, it will work for the figure in almost any pose. The only thing missing is a swivel to hold her horizontally. As mentioned above, Batgirl's accessories really don't have anything to do with the episode "Torch Song." 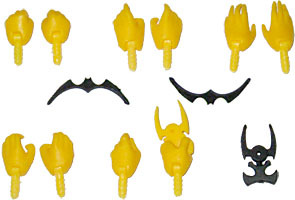 She comes with two slender batarangs, a two-piece grapnel launcher, and then all the hands! Seriously, in addition to the "relaxed" pair she's got on in tray, there's a pair of fists, a pair of "gripping" hands, a pair of "holding" hands, and a pair of weapon hands - two lefts, one posed to pinch a batarang, one holding a grapnel launcher (which is molded in the same yellow as the hand, and not painted at all; what happened there?). This same Batgirl is coming out again later this year in a five-pack with Poison Ivy, Livewire, Supergirl and Harley Quinn, but there's no way that one is going to come with all these accessories. It may be worth waiting for that set, if you don't mind having fewer hands and weapons.